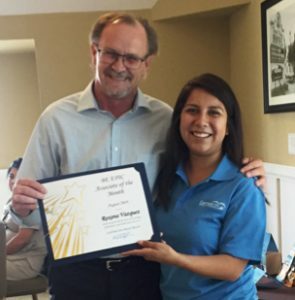 We love celebrating our employees, and this month we’d like to congratulate Roxana Vazquez on being selected as August’s Be Epic Champion! Roxana has been with the Carlsbad Inn since April of 2017, having first started as an Activities Attendant. You can now see her smiling face at the front desk, where she works hard to make guests and owners feel like family at the Carlsbad Inn. We had Roxana answer some fun questions so that you can better get to know one of our Super Star Associates! Where are you from/ how did you end up at the Carlsbad Inn? I’m from Carlsbad. My mom has actually worked at the resort for almost 15 years. She had always told me it would be a good job to have while in school, so when I saw an opening in Activities, I applied. Favorite place to eat in the Village? Jay’s Gourmet– they have the best ravioli lunch special! Do you have any siblings and/or pets? I have an older sister and two younger brothers. Are you in school? What are you studying and why? Yes, I attend Cal State San Marcos, where I am studying Global Studies and Spanish. What inspires you? My parents- they inspire me to do better for myself and others. If you could have any super power, what would it be and why? I would love to fly so that I could visit places all around the world. People would be surprised if they knew….that I have always lived close to the beach, but I don’t swim. Favorite vacation that you’ve taken? My favorite vacation was going to Oaxaca, Mexico for my parents’ wedding. What is your favorite part about working at the Carlsbad Inn? The people that I work with. Everyone is very welcoming, and they make the job so much better.